I am building a form for singer/songwriters to submit an mp3 file for a contest. I have encountered a file size limitation of 1024kb. This will be a problem. If I upgrade to the $19 per month plan, is this file size limitation increased? 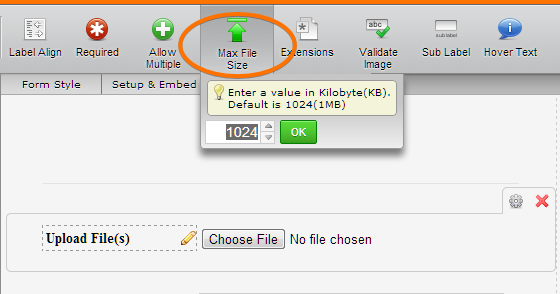 You can adjust on your file upload field the file size limits on your form. To do this, simply edit your form, select the file upload field, and click the Max File Size button on the tool bar and adjust the size limit to your desire. The maximum allowed is 1GB (1000000KB). But please take note that free users shall be restricted to the allotted file storage space of 100MB in total file upload submissions (in accumulation or in single file upload submission).